I have been looking at job discriptions and most want exerpience with LMS systems,are there free ones to download so that I can start to practice? Any suggestions which one is better? Must email other guests to join this account. Learning to develop apps using Appcelerator is fun and it's free - however, is not that easy as you think it is. Worry not, I'm here to share my experience with you all. Today's post I would like to share the basic fundamentals of developing in Titanium Appcelerator. Hi everyone, I have done my podcasting in my wiki journal. the link is story and for the voicethred photos. The educational value of the podcasts is that it can be created from original material by students and teachers or existing audio files can be downloaded for classroom use.Creating a podcast allows students to share learning experiences. Teachers can use the technology to provide additional and revision material to students to download and review at a time that suits them. Not a fan of podcasting, can very easily become distracted if not have written dialog to follow. Love the notion of Voicthread, however system is so powerful need, to shutdown all other applications just to run the program. Note: the internet isn’t very strong or reliable where I am located. If you as a student or a teacher ever have or give an assignment to create a timeline then using time toast is one of the best. Use this site to create an "All about me" project or to present some historical event for history. You can create short time periods to very very long time periods. If you need a report on the major events that shaped United States history then time toast might be what you are looking for. This is a blog about the webinars that I attending and ways that I can incorporate the information into my classroom. 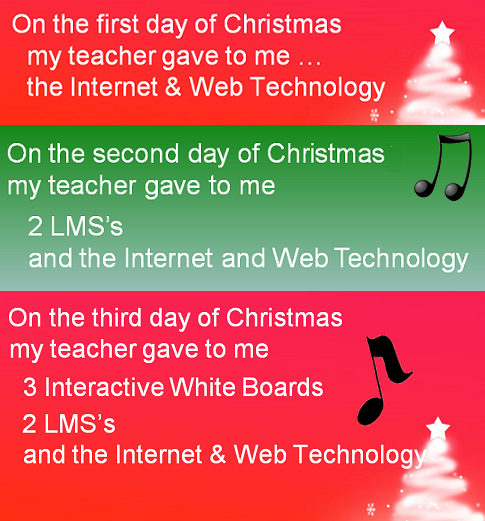 Join us for a romp through the popular Christmas song, with an Education Technology twist!